Morten T. Hansen is a management professor at University of California, Berkeley. He is the coauthor (with Jim Collins) of the New York Times bestseller Great by Choice and the author of the highly acclaimed Collaboration and Great at Work. 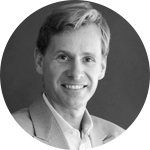 Formerly a professor at Harvard Business School and INSEAD (France), professor Hansen holds a PhD from Stanford Business School, where he was a Fulbright scholar. His academic research has won several prestigious awards, and he is ranked one of the world’s most influential management thinkers by Thinkers50. Morten Hansen was also a manager at the Boston Consulting Group, where he advised corporate clients worldwide. Morten travels the world to give keynotes and help companies and people become great at work.